I’m doing the thing that we said to do: I’m knitting a pattern until it’s burned into my memory like a hand-clapping song from grade school. Downtown, baby, downtown, a rollercoaster! 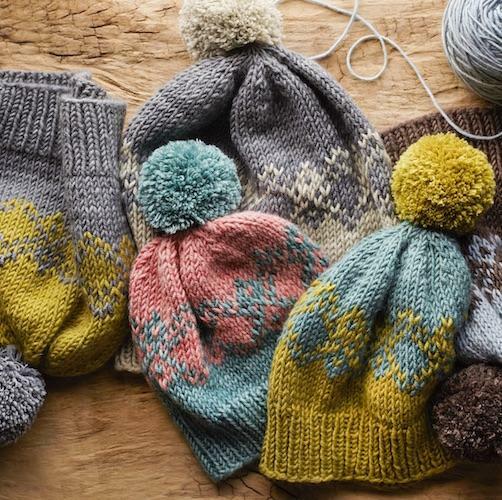 The pattern: the Stranded Diamonds Hat by Thea Colman, from MDK Field Guide No. 8: Merry Making. I started out thinking, I’ll just knit the 12-month size. That’ll take no time at all, and I can get back to my regularly scheduled knitting, aka a sweater for me. The 12-month size hat did take no time at all. 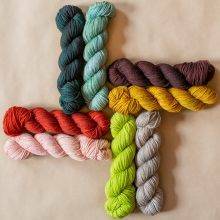 It also left me with a lot of leftover yarn and a question: could I get a second hat out of my allotted two skeins of Shalimar Enzo Aran? Midway through hat no. 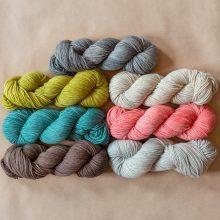 2, in the largest size, my two colors (Sand Dollar/cream and Water Chestnut/brown) made me think of sock monkeys. If I put red pom poms on my hats, they would call to mind sock monkeys, which would be amusing to me. 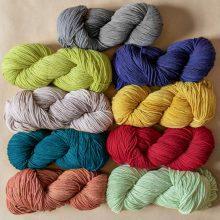 And if I used a third yarn for the pom poms, I might be able to get a third hat out of my 2 skeins. So that’s where I’m at, on hat no. 3. 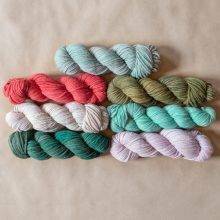 Despite my dwindling yarn supply, I’m making it in the largest size, because I know a little family with 2 adults and one pumpkin-headed baby, and I think they would be open to wearing sock monkey hats. The pattern is not quite burned into my memory. I still need the chart for the 10-stitch colorwork pattern, and a little review when I get to the decreases at the crown. Will make wonderful gifts. I’ll purchase the book at Rhinebeck. I love your sock monkey hat idea! I’ve justade my daughter a sock monkey style hat (using a pattern I found on Knitty) and she wears it 24/7. We’re currently in Japan on holiday and her hat has its own IG account documenting it’s travels…. So funny. Why do I remember the lyrics of so many songs but not where we went for dinner two nights ago? Poison Iiiivvvyy. Poison Ivvvvvy. Late at night while you’re sleeping…. Because music is stored differently in the brain. Add a physical action even better because that gives your brain 2 reference points. My Mom had trouble remembering me but could still play the piano! *in the interest of full disclosure, I also have a Matt, Megan, Michelle, Marc and a Murphy and our first dog (long ago) was Molly. Anyone have clapping games for those names? I am going to be signing hand clapping songs in my head all day! The hats looks great! I’m slip stitch capping right now, then Chalice cowling— then the stranded diamondzing will commence. I already feel as if I’ve missed points due to the missed sock monkey opp! I’m thinking that sock monkey hats (matchies!) for me and the dog would be perfect for our holiday cards! Because who doesn’t want to dress like their dog?! You can do a super-subtle “tonal” Stranded Diamonds hat. No? I guess not. Hand clapping songs!! There were a couple I could practice on the kitchen table when no hands were available. There’s an earworm to take to work today! They were doing very deep hand-clapping songs where you come from. Shimmy, shimmy coco pop….haven’t heard or thought of that song in longer than I can say. Immediately, when I read that I remembered how my Dad would tease my sister and I with those lyrics. You sure put a smile on my face today! What a sweet memory. 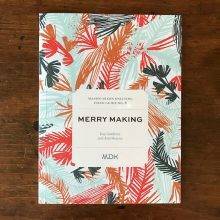 I just ordered Merry Making book last night. Really love the Chalice Cowlcan’t wait to cast on!! I had forgotten the Texaco one. Thank you! I have a friend who just hand-sews a polar fleece forehead band inside all her rustic wool hats and I think this is much easier than a knitted solution. I have also used a more time- and yarn-consuming solution, which is to make a band out of the cotton elastic yarn, Fixation (by Cascade). It not only reduces the itch factor, it can also make a slightly too big hat fit better! I love Fixation for many projects, and wish it came in more (darker!) colors. 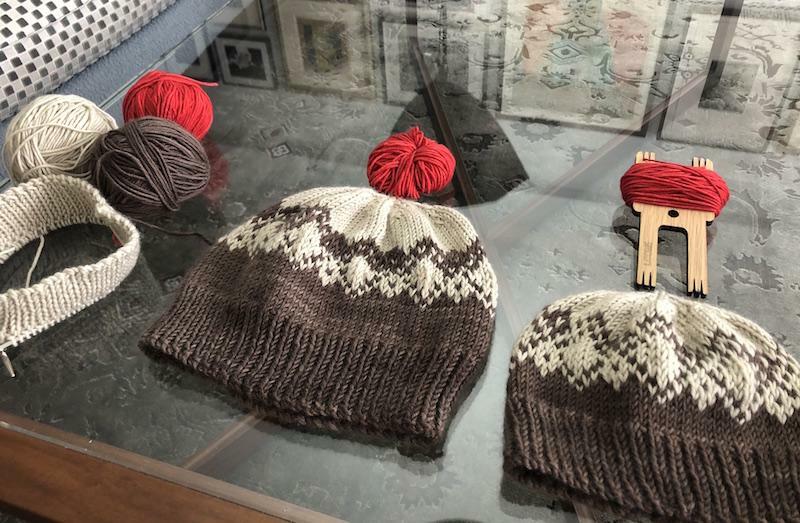 Kay, I’m surprised that you haven’t yet jumped on the slip stitch hat bandwagon. The pattern is like a mini ballband warshrag with its “mortar” slips and bricks (only soft and squishy and wooly rather than crisp and cottony) and I didn’t want to stop knitting. I’m thinking my baby granddaughter might need a stroller blanket or sweater yoke with this pattern to match the hat I’m making (which is adult size so I’ll just have to knit another one in baby. Oh darn. ). There should be a surgeon general’s warning on the cover of your field guides: CAUTION! Contents may be addicting. Intervention may be necessary! I KEEP WAITING FOR THE YARN FROM NASHVILLE. It’s like the Wells Fargo wagon! I have a feeling the Slip-Stitch Cap is going to be done, and overdone, once I get started. Love the idea for a squishy stroller blanket! Love your blog, loyal daily reader! Do whop do whop!! My favorite hand clapping ‘song’ was called (by us at least) “Leansies Clapsies” and continued “turn about, tabapsies. highsidies. lowsidies. touch my knee, touch my toe, touch my heel .and under we go!” which we did while bouncing a ball in various ways. I now, for the first time realize what that linereferred to given our preceding verses. As if we needed more proof that NYC in the 70s was not prissy. Go girl. I love your thinking. 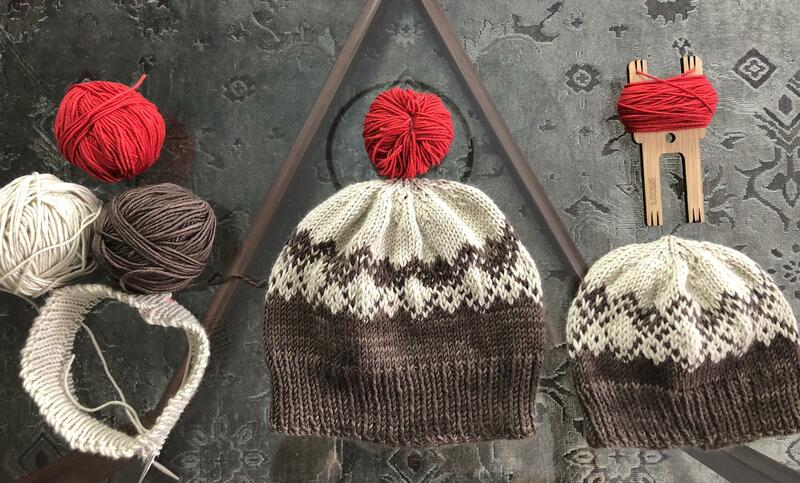 Three hats are always better than one, especially with Christmas coming. I really like this hat and the colors that it is illustrated in. Also, the color dominance is an eye opener. Our version of the handclapoing song was “Down down baby, down by the roller coaster; sweet sweet baby, I’ll never let you go, shimmy shimmy coco pop shimmy shimmy pow; shimmy shimmy coco pop shimmy shimmy pow. “. I was both a camper and a camp counselor for many many years so I have a great number of these songs that I taught my kids.